Queens Park Rangers consolidated their five-point lead at the top of the Championship with a hard-fought win over a stubborn Ipswich. Rangers had to wait until the 77th minute for the breakthrough - and it came courtesy of Clint Hill's bullet header from Adel Taarabt's corner. Hill turned provider six minutes later as Heidar Helguson's header put the result beyond doubt. Ipswich remain in mid-table, while QPR stay on course for the Premier League. 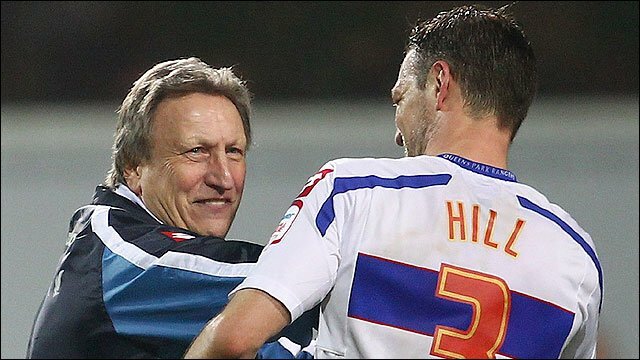 But Neil Warnock's side were made to work for the win against an Ipswich side resurgent under new boss Paul Jewell. The impressive Connor Wickham, 17, came close to giving the Tractor Boys an early lead after he found space to unleash an angled drive that Danny Shittu did well to block. On the half-hour, Shittu's defensive partner Fitz Hall threw himself in front of a thunderbolt from Grant Leadbitter to deflect the shot over the crossbar. After the break Rangers showed more attacking intent as Ishmael Miller's close-range shot was saved by Marton Fulop before Helguson's header flew inches over the top. But the breakthrough finally came when Taarabt swung in a corner which was met by a powerful header from Hill at the far post. Wayne Routledge almost hit a second but Fulop saved his powerful drive. The final blow arrived in the 83rd minute when Hill galloped into unfamiliar territory for him, overlapping on the left to cross for Helguson, who buried his header to secure three more vital points. 90:00+4:11 The referee ends the match. 90:00+3:43 Carlos Edwards gives away a free kick for an unfair challenge on Alejandro Faurlin. Patrick Kenny takes the free kick. 90:00+2:36 Tamas Priskin takes a shot. Patrick Kenny makes a save. 90:00+1:35 Luciano Civelli takes a long range shot clearing the crossbar. 90:00+0:42 Substitution Danny Shittu leaves the field to be replaced by Matthew Connolly. 89:10 The assistant referee signals for offside against Tamas Priskin. Patrick Kenny restarts play with the free kick. 88:20 The assistant referee signals for offside against Connor Wickham. Patrick Kenny takes the free kick. 83:51 Substitution Luciano Civelli comes on in place of Lee Martin. 82:48 Clint Hill provided the assist for the goal. 82:48 GOAL - Heidar Helguson:QPR 2 - 0 Ipswich Heidar Helguson grabs a headed goal from inside the six-yard box. QPR 2-0 Ipswich. 82:11 Wayne Routledge takes a shot. Save by Marton Fulop. 81:12 Shot from long distance by Tamas Priskin goes wide of the left-hand post. 77:38 Unfair challenge on Adel Taarabt by Jimmy Bullard results in a free kick. Patrick Kenny restarts play with the free kick. 76:27 GOAL - Clint Hill:QPR 1 - 0 Ipswich Clint Hill scores a headed goal from close in. QPR 1-0 Ipswich. 75:32 Unfair challenge on Clint Hill by Tamas Priskin results in a free kick. Patrick Kenny takes the free kick. 74:53 Substitution Akos Buzsaky is brought on as a substitute for Ishmael Miller. 74:26 Adel Taarabt takes a shot. Save by Marton Fulop. 73:00 Adel Taarabt concedes a free kick for a foul on Damien Delaney. Indirect free kick taken by Marton Fulop. 71:56 Free kick awarded for an unfair challenge on Connor Wickham by Wayne Routledge. Indirect free kick taken by Marton Fulop. 70:42 Fitz Hall gives away a free kick for an unfair challenge on Tamas Priskin. Indirect free kick taken by Marton Fulop. 70:13 Outswinging corner taken right-footed by Adel Taarabt from the right by-line. 70:13 Substitution Tamas Priskin replaces Jason Scotland. 68:54 Inswinging corner taken from the left by-line by Adel Taarabt, save by Marton Fulop. 66:28 Jason Scotland concedes a free kick for a foul on Patrick Kenny. Patrick Kenny restarts play with the free kick. 62:19 Grant Leadbitter challenges Heidar Helguson unfairly and gives away a free kick. Free kick taken by Patrick Kenny. 59:51 Lee Martin takes a shot. Save by Patrick Kenny. 58:22 Wayne Routledge handles the ball and concedes a free kick. Indirect free kick taken by Marton Fulop. 57:33 Inswinging corner taken from the left by-line by Adel Taarabt, Danny Shittu takes a shot. Carlos Edwards gets a block in. 57:09 Mark Kennedy gives away a free kick for an unfair challenge on Adel Taarabt. Free kick crossed by Adel Taarabt, Damien Delaney manages to make a clearance. 57:09 Booking The referee shows Mark Kennedy a yellow card. 56:30 Jason Scotland takes a shot. Blocked by Fitz Hall. 54:58 Inswinging corner taken right-footed by Adel Taarabt played to the near post, Gareth McAuley makes a clearance. 53:59 Jason Scotland is flagged offside by the assistant referee. Patrick Kenny takes the indirect free kick. 51:08 Short corner worked by Lee Martin. 48:46 Adel Taarabt takes the inswinging corner, Close range header by Heidar Helguson goes over the crossbar. 48:22 Adel Taarabt takes a shot. Blocked by Grant Leadbitter. 47:33 Free kick awarded for an unfair challenge on Danny Shittu by Jason Scotland. Free kick taken by Danny Shittu. 45:00+1:12 The match has reached half-time. 45:00+0:27 The assistant referee flags for offside against Ishmael Miller. Indirect free kick taken by Carlos Edwards. 44:17 Free kick awarded for a foul by Adel Taarabt on Andy Drury. Carlos Edwards takes the free kick. 43:28 Free kick awarded for an unfair challenge on Shaun Derry by Grant Leadbitter. Free kick crossed right-footed by Adel Taarabt from right channel. 43:01 The offside flag is raised against Connor Wickham. Indirect free kick taken by Patrick Kenny. 42:48 Jimmy Bullard takes a shot. Blocked by Fitz Hall. 39:37 Free kick awarded for a foul by Heidar Helguson on Carlos Edwards. Marton Fulop restarts play with the free kick. 39:37 Substitution Andy Drury replaces Colin Healy. 38:48 Fitz Hall takes a shot. Damien Delaney gets a block in. 38:08 Corner taken by Adel Taarabt from the left by-line, Colin Healy manages to make a clearance. 35:43 Corner taken by Adel Taarabt from the left by-line, Danny Shittu takes a shot. Damien Delaney gets a block in. 34:51 Header from close in by Gareth McAuley misses to the right of the goal. 34:04 Corner taken right-footed by Jimmy Bullard from the left by-line to the near post, clearance made by Clint Hill. 33:12 Shot from long range by Grant Leadbitter misses to the right of the target. 32:35 Free kick awarded for a foul by Clint Hill on Lee Martin. Jimmy Bullard crosses the ball in from the free kick, Shaun Derry manages to make a clearance. 31:03 Damien Delaney concedes a free kick for a foul on Adel Taarabt. Free kick crossed right-footed by Adel Taarabt from left wing, Connor Wickham makes a clearance. 30:24 Outswinging corner taken by Grant Leadbitter, clearance by Clint Hill. 29:57 Grant Leadbitter takes a shot. Blocked by Fitz Hall. 24:26 Unfair challenge on Shaun Derry by Grant Leadbitter results in a free kick. Free kick taken by Patrick Kenny. 22:28 Long range shot by Jimmy Bullard goes wide right of the goal. 16:32 The official flags Bradley Orr offside. Marton Fulop restarts play with the free kick. 14:56 Inswinging corner taken by Jimmy Bullard from the left by-line. 13:35 Free kick awarded for a foul by Clint Hill on Jimmy Bullard. Carlos Edwards takes the indirect free kick. 10:46 Grant Leadbitter has shot on goal from a long way out that goes wide left. 5:35 Damien Delaney is caught offside. Free kick taken by Patrick Kenny. 4:14 Corner taken right-footed by Adel Taarabt from the right by-line, Headed effort from inside the area by Fitz Hall misses to the right of the target. 2:19 Adel Taarabt takes the outswinging corner, Danny Shittu has a headed effort at goal from close in which goes wide left of the goal. 0:19 Free kick awarded for a foul by Colin Healy on Shaun Derry. Free kick taken by Fitz Hall.